Audrey Cianfarani, a Registered Practical Nurse at Etobicoke General Hospital – William Osler Health System, began her Nurse Associate Designation when she felt there was a gap of knowledge she wanted to fill in her practice with a better understanding of oncology. 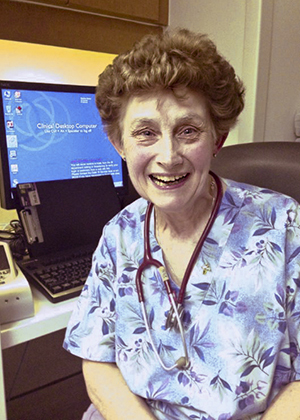 As a skilled and knowledgeable RPN in palliative care, for over 36 years, she still craved a larger and more comprehensive perspective on the journey that her patients and families had experienced before she was acquainted with them. Audrey’s designation gave her the much needed confidence and tools she was looking for, to effectively communicate and engage in meaningful conversation with her patients and their families. Most recently, Audrey also completed the Capstone Project with Lambton College, making her the first de Souza Designate to achieve the double de Souza Nurse Associate and Lambton College Certificate in Oncology.